120 COLORFUL BLENDS & SHADES – Variety of Colors including Red, Blue, Yellow, Green, Purple, Orange, Black, Brown, White, and Many More! 100% NON-TOXIC & ASTM APPROVED – Our Markers Are 100% Safe for Children, Kids, Students, Adults, and Teachers! Great that the colours wash out of fabrics as you don`t have to worry about the odd mishap . Really good range of colours and always good to have some on hand. These are great! 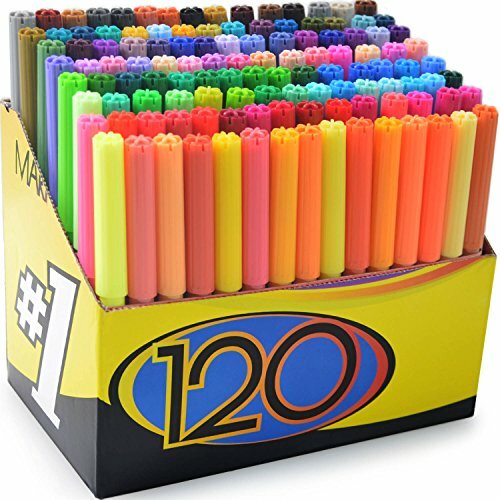 Awesome price for 120 marker pens. You can never have enough markers when you have 8 nieces and nephews.